I may have mentioned somewhere before that I am not that keen on yunnan tea, despite being an avid tea drinker in general. It's definitely more inviting to me than, say, pu-erh—but yunnan is a kind of meh tea experience for me. Small wonder, then, that my least favorite of the Hermessences turns out to be this one. This may simply be a case of “familiarity breeds...” well, not exactly contempt, since I do not positively dislike wearing this fragrance. Still, I don't dream about it. The tea note is far more marked than the osmanthus, which to me is the tofu of flowers anyway, basically soaking up the flavor of whatever it is with. In this case, that would be yunnan tea. Yes, to my nose, Osmanthe Yunnan is practically a yunnan tea facsimile perfume. Unlike Poivre Samarcande, which gives off ever-so tiny wafts of the effect of an Assam black tea (though the composition apparently contains no tea), Osmanthe Yunnan explicitly claims to feature and does in fact, as advertised, convey the literal scent of yunnan tea. There are other notes listed, but to me this is a virtual facsimile. Wearing this fragrance makes me feel as though I just took a soak in a bathtub filled with yunnan tea. To wear yunnan tea as a fragrance, or not to wear yunnan tea as a fragrance? That is the question. When it comes time to drink tea, I much prefer darjeeling or assam or sencha or... But, to be perfectly frank (quoi d'autre? ), I'm not sure that I am all that interested in smelling like yunnan. It's a slightly smokey smell, yes, but in the end, it's yunnan tea. 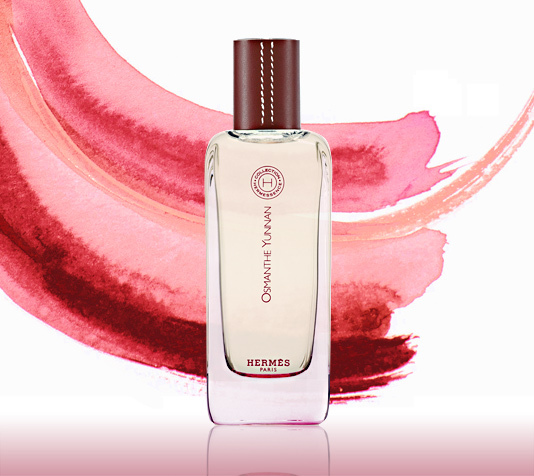 Osmanthe Yunnan is certainly wearable, but I find it considerably less compelling than the other Hermessence perfumes... It is always possible that I am hyposmic to osmanthus, so I do not want to dissuade others from trying this creation! This is by far the nicest sandalwood-centric perfume I've smelled in recent history—if not ever—and there have been many since sweet sandalwood somehow became designated as “the juice” from which to start many a designer launch. Am I right to assume that we are talking about sandalwood here, and not some synthetic surrogate? Not sure, to be honest, but this is certainly a far cry from the sour and sorry excuse for sandalwood which forms the basis of far too many mediocre mainstream designer fragrances. Some perfume consultant must be telling designers who are in the market for an eponymous fragrance that “sandalwood-vanilla is a wonderful combination!” Unfortunately, by now it's pretty hackneyed as an idea, and the execution is just not very good, I gather because of the sandalwood shortage. That and the vat production of chemical soup. 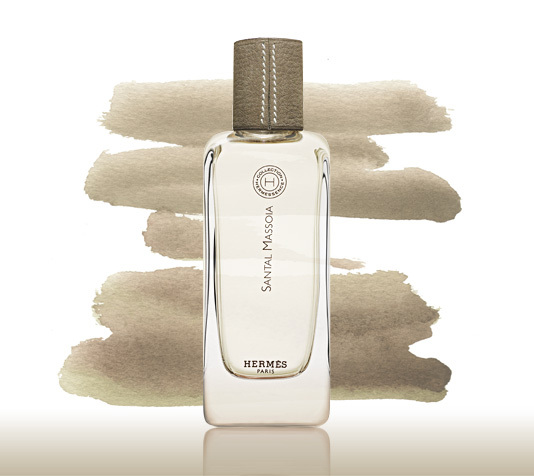 The sweetness in this perfume appears not to be due to vanilla (the usual suspect), but there's enough sugar in this composition to make it closer to an oriental than a woody perfume. Some gents therefore may find Santal Massoïa too feminine—but not by much. I would call this a unisex scent, and I have no doubt that more sophisticated gentlemen perfume lovers could wear this well. In the drydown, I detect an emergent pseudo-woody fig quality which may or may not appeal to some wearers. But it does to me! The quasi-coconut milk note (apparently constructed from massoia and “milk”) adds creaminess but not the scent of coconut, which will be good news for those who eschew suntan lotion and monoi facsimiles. Santal Massoïa is a very simple perfume. If you like natural-smelling, slightly sweet and creamy sandalwood, then you'll like this scent. It's not a complex or provocative perfume. Its beauty lies in its sheer simplicity. This creation wears very well, and in my quest to whittle the Hermessence list down to five, I have to select this one over Osmanthe Yunnan. Hello, again. Been kinda busy here. Actually, Osmanthe Yunnan is currently the only full 100 ml bottle I have. When I first had a sample, it pretty much left me cold. It pretty much smelled to me of.... nothing. However, I once tried it in the summer, on a day where temps were approaching 100... and it was just beautiful. It realy blooms in the heat. So, just as I have some perfumes I can only wear on the coldest of cold days, I can only wear Osmathe Yunnan on the hottest days of the year. The rest of the year it just doesn't register. Is that worth a full bottle? I thought so. I have a 15 ml travel size of Santal Massoïa. I like it n all but I don't think it smells of sandalwood at all.